The recent updates in Blender and all future developments make an excellent collection of textures critical to any digital artist using Blender. For architectural visualization, the relevance of textures is also important. Blender has now a shader called Principled BSDF that works great with textures prepared for PBR. What is PBR? It means Physically based rendering and the technique tries to recreate the real-world in the render. A PBR material is something that emulates the physical behavior of surfaces. If you have a collection of textures ready to create PBR materials, you will achieve better results quickly. 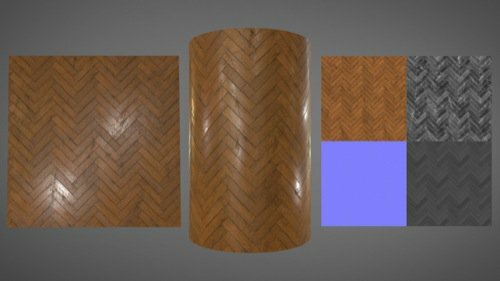 Do you want to download some free PBR textures? An artist called Artem Lebedev is sharing an incredible collection of PBR materials using Gumroad to distribute the files. You will find several materials and textures used for architectural visualization like wood floors, bricks and stone tiles. To download the files, you will have to set a value for the texture collection and to get it for free just set it to zero. Since the texture collection is all PBR, you will find several maps for each material. For instance, you will find maps for the diffuse, normals, reflections and more. But, if you have plans to use the files in commercial projects it will be nice to donate something to the artist. How big are those textures? The total size of those textures is 5.58GB. Yes, almost 6GB of textures for architectural visualization. Donâ€™t miss this opportunity to download an incredible and free collection of textures for architectural visualization. Do you want to receive assets like this one in your inbox? Consider becoming a premium subscriber of Blender 3D Architect to receive assets, textures, and guides. Our subscribers receive download links almost every day! What kind of content premium subscribers receive? Look at our reports to find a list of content we sent to premium subscribers.